Everyone has a list of things that wish to have...this has been on my list for a very long time now, but the reason I've not bought one yet is that..I can't decide on the colour for this Le Creuset! Help me? Orange is bright and nice..while the Blue...I do wished it was more Royal Blue than Dark Blue.. If you did not know, I am a BIG FAN of Anything Marc by Marc Jacobs! I saw this bag about a month ago..maybe. 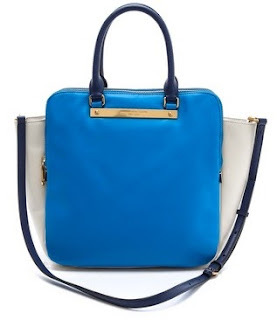 Love this colour block bag, how striking is the blue!